Martin Mowforth (MM): …. 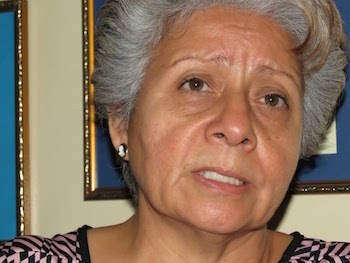 Some thoughts of Berta Oliva de Nativi about the case of the 35 high-placed government officials, including those from the Honduran Armed Forces. My question is: do you believe that the resolution of these 35 cases would clean up the situation in Honduras, or is it simply the tip of the iceberg? Do you follow? Berta OlivaO: Look, yes, I think that the issue of the detentions following on from the extraditions of people from our country is not going to resolve any problem. What it’s reflecting is the inexistence of a system of justice in our country – the incapacity of those who administer justice in Honduras. What it also shows is the complexity of the degraded state of affairs that our country has unfortunately fallen into after the military coup. It becomes more and more worrying because one sees the human rights organisations have been accompanying not [specific] cases but processes in the country in order to document, help and position themselves with respect to the different petitions which are legally recognised in our country. This gives the chance to the same authorities which claim that they are conducting investigations to bring prosecutions to the courts in Honduras. Why [do the human rights organisations do this]? To return hope to the Honduran people who are eager to see justice. But we have constantly seen that there is manipulation covering up technical knowledge in human rights, throughout the whole justice system, cleaning up everything as regards human rights. But what we see every time is the strengthening of impunity in Honduras. And impunity then allows aggression towards human rights defenders in general. Also we see the complicity of those who are charged with imparting justice in the corruption that our country generates, a country full of impunity. So the extraditions reflect that, that we do not have a system of law, we do not have a system of justice that is capable of carrying out an investigation and of applying sanctions. And we don’t have such a system because when extradition charges are brought or when we mention the extradition of members of the National Council or Deputies or even Congress members, some local authorities, such as Mayors or Deputies – these are the authorities which represent the different legal structures established in our country, and they are the ones on the list or who have been charged [with extradition]. So we have a lot to do to understand why there is no justice in Honduras and why it’s going to be so hard to return to this position of building the hope that Honduras can change in terms of the application of justice. For one, because it’s interesting to see that it is these same authorities who are linked to organised crime and who are part of the structures of terror which are part of the phenomenon of narco-trafficking. So when they are charged, when they are accused in the courts, we have a complex situation in the country. It is the authorities which are part of the problem of organised crime, of narco-trafficking and of the serious and constant violations of human rights. We have a country so degraded that every time fewer Hondurans get angry in our own country. Why? Because we don’t have anyone to turn to, an authority which can solve the problem. You have to come from abroad to see how to help resolve such an acute crisis in Honduras. With sorrow, with concern and with indignation, I can tell you today it is a country that suffers serious intervention. We are under complete control. Here we have, for example, the presence of the Southern Command of the United States [which] is more than evident. Here one can see how the international organisation MACCIH [Support Mission Against Corruption and Impunity in Honduras] operates; it says it aims to combat corruption in Honduras or at least helps to combat corruption. But also all the time the International Red Cross is being strengthened in Honduras. Why? Because something serious is happening here. We also have the presence of the offices of the High Commission [UNHCR, the UN Refugee Agency]; although this doesn’t work for the defenders, but the reason that there is a presence and offices of the High Commission in any country is because it is a country in crisis, and it also suffers a high degree of outside intervention. And there is a strong presence of the UNHCR in Honduras. And simply we have the presence of PBI [Peace Brigades International], which although it helps the defenders is here because they are aware of the crisis and the agony that we have in Honduras. So, I make these remarks because I always see a tendency from central authorities, from the government, to believe that militarising the country, re-militarising Honduran society and the state’s institutions is going to resolve the problem which it’s been incapable of resolving because that [militarisation] is part of the strategy. From within the state they create a culture of fear through violence: public insecurity, legal insecurity, the student crisis, the education system that we have in the country; it is so worrying because in a country where the education system is permanently in crisis, it’s logical that the results are going to be so mediocre that we are going to have a population with much more illiteracy than we currently have. So I believe, I’m absolutely convinced, that the situation in the country is deteriorating, and it’s becoming increasingly debased. And the human rights defenders, especially those with human rights organisations, that we have worked with accompanying processes and the victims – we are at permanent risk. And that costs us dearly because personally I work for the promotion of life, the promotion of liberties, for the strengthening of a state of law so that we can have those rights, to see how we can recover our rights. So we’re aware of the risks that face us, but we’re not going to recommend saying “I’m at risk”, because then we would dedicate ourselves to protecting ourselves and that would generate tension which they would see in us. And I’m concerned, really concerned, that the people in the communities, in the interior of the country, those who are unseen, that they are not protected. I believe that it’s important that the international organisations must understand that to protect human rights defenders and organisations you have to be part of a chain. You protect me because I carry out a function of accompaniment, of follow-up, of exposure and of action on the ground. BO: So it’s a game of chess, like moving a chess piece, but we also have to be aware of it. First, I think that to understand the logic of what we are living through, you have to have a class consciousness. MM: Yes, I understand. OK. Many thanks. One las question please. Do you think that a CICIH [International Commission Against Impunity in Honduras], like the CICIG in Guatemala, would be a route out of the Honduran problems? I imagine that that won’t be very realistic because the government is blocking the possibility of creating a CICIH. But they’ve already created their own investigative organisation. But do you think that a CICIH would be a possibility? And would it be a serious path out of the Honduran problems? Berta Oliva: Look, with the levels of breakdown of the country, I believe that we have to begin to re-establish our participation as citizens. The government has done all it can to create the culture of fear, to keep us in silence so that we say nothing and are unable to join together. But it’s also doing everything it can to impose its own structures and mechanisms, making use of its international alliances and also taking advantage of international treaties and conventions to put in place its own spaces which certify its actions. Far from calling for the government and the authorities for a non-continuation along this route, what we have in the country is a process of certification of violations of human rights and of citizen rights. So at the present moment I don’t see that a CICIH in the Guatemalan style can be installed in our country. Why? Because it has to have the approval of the government in order for it to function well. And it’s not convenient for the government to have a CICIH because there is already the example of what happened in Guatemala. So it’s not going to want to create a space of that kind so that within one, or ten, or five, or four years, it brings to life what the government in Guatemala is experiencing. So, I think that at first what must be done is the empowerment of Hondurans, to begin to speak, to begin to articulate, what we are left with to adjust, to juggle with the necessities really. Because I’m going to say: the government also has a strategy to submit the majority of the Honduran people to hunger. Through unemployment we get the buying and selling of people at a local level, and those who can’t buy are submitted to fear. There is a strategy to place us, for example human rights defenders, against the majority of the population. We can’t continue to remain silent about the levels of criminalisation which we face in the country. I can tell you that lately, whilst the government has been working on international lobbying to say that it has advanced on human rights, here they continue criminalising people. On Friday last week, six campesinos from the ‘El Paraíso’ ranch were criminalised for defending a piece of land on which they could live and eat. Amongst the six campesinos is a human rights defender who has been a beneficiary of our training programme for empowerment and who represented human rights defenders locally. And on this we can say that he is a member of the ‘El Paraíso’ network; that is, a defender found guilty today. But likewise another defender of the South network, who has also benefitted from our programmes and who even managed to create networks of human rights defenders, has been arrested and convicted. We’ve managed to get him liberated, this human rights defender from the south of the country, but conditionally. MM: The ‘El Paraíso’ ranch is in the south? BO: No. The southern network is in the south of the country, and it’s there that Abel Pérez was convicted. He was arrested, we managed to get him out, but his freedom is only conditional. And he has to present himself to the Judicial Power, saying that he is there, that he’s not doing anything bad, prohibited from going near the land he was defending and where he was accompanying those who were recovering a bit of land. And the ‘El Paraíso’ network is in the north-west and has a border with [the department of] Olancho. BO: With Olancho and with Nicaragua. BO: So there we are, we have to denounce this type of deed. That is to say, feel for the defenders, they are imprisoned because they accompany those who recover a little piece of land which they have worked on for years. And they are submitted to an unjust system of justice, but they say “No!” so they’re submitted to the law, and the law is what it says. And so it becomes clear in this sense that not all the law is just because they are committing injustices not only against the campesinos, but as much against the human rights defenders. Apart from this burden that affects us, there is a campaign of permanent criminalisation. Today the government sees the human rights defenders as the enemy, like before they saw us as those who were accused and who were then disappeared as terrorists. Now they look upon the defenders in the same way as if we give a bad image of the country; so they declare us to be bad Hondurans because we speak and say what is happening in Honduras. MM: Yes, I follow. OK.
BO: So, as far as the MACCIH is concerned, I don’t believe that it can be installed in our country at this moment. Sorry, I don’t believe that a CICIH can be established here. What we do have is a MACCIH which has already been here for two months, and we have seen that it is largely silenced; and whilst everything happens, nothing happens. They don’t notice the danger. MM: Yes. OK. Very many thanks Berta.